Click the button below to add the Grow New Hair Conditioner #Conditioners# to your wish list. Increase the appearance of added volume and fullness while rich botanicals from around the world touch your strands for the first time. Imagine sleek, soft and radiant hair. Damaged, weakened hair may benefit from the mineral and vitamin content in this conditioner so that hair is strengthened for less hair fall and a fuller look over time. Many conditioners use silicone or other chemicals to smooth and soften. Instead, we formulated our conditioner with ingredients that add natural goodness while softening and smoothing hair. Ingredients such as avocado, macadamia, carrot seed, grape seed and more. Promote an appearance of thicker, fuller, and stronger hair without weighing it down. Free of artificial color and fragrance, silicones, parabens and is safe to use on all hair types, including colored treated hair. I started using the grow new hair shampoo and conditioner about 3 or 4 months ago and, my hairdresser let me know that there is new hair growth and my hair is thicker and looks healthy. Yay!! One reason that I picked these was they do not contain harsh chemicals like other hair loss products do. Yes, it’s a little pricey but well worth it. My hair is looking great, and I feel so much better. Just remember nothing works overnight give it time. This conditioner is full of benefits that won’t weigh hair down. With use, your hair will feel more supple and voluminous for a full and revitalized appearance. Jojoba, Olive, and Coconut are great for moisturizing parched hair. Avocado will invigorate and encourage a healthy environment for your scalp. Castor has been used for centuries as a treatment to promote thick, luscious hair. It works as a lubricant to prevent further damage from the wear and tear of frequent washing and combing. Castor also soothes an itchy, flaky scalp and will not clog pores. I could tell after just a couple of washes that my hair felt thicker and stopped thinning. My hair has finally stopped falling out. Too early to know if it is helping with growing new hair but I used to have a handful of hair in my brush every day now I just have a few strands. I use about one or two quarter size each time, and this works well for me. The bottle should last at least three months or longer. My husband and I love how our hair feels after only a few washes, and I can already see a difference in the health of the hair strands. I will reorder this again. Thank you. It has been two months since I purchased these. While I was never balding, I always use natural type shampoos to keep my hair and scalp healthy. I’ve had two haircuts by 2 different stylists at the same salon, and both said my hair was thicker. 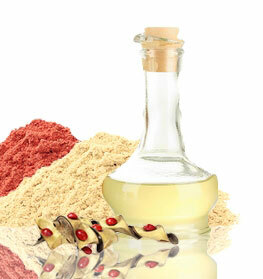 In addition to the shampoo and conditioner, I am using the nutritive vinegar rinse just one time every two weeks. My scalp has never felt so good. I believe this shampoo and conditioner are working. No Sulfates, Parabens, or Silicones. Jojoba, Olive, and Coconut oils are great for moisturizing parched hair. Castor Seed Oil moisturizes hair, preventing split ends and treating dandruff. Massage the GNew Hair Conditioner into your hair. • Take advantage of this conditioner by leaving it on longer or by incorporating heat. The ingredients will have time to penetrate the scalp and make hair super soft. Use a plastic cap under a hair dryer or blow dryer and sit for 10 to 15 minutes. • If you do not have a hair dryer or blow dryer, we suggest using a warm towel instead. • You can use a small amount of the product in the hair to double as a leave-in conditioner. When rinsing, leave some conditioner in. This is great for dry or damaged hair. • You can pair this conditioner with our Grow New Hair Shampoo. • Can be used daily. We suggest washing the hair once or twice a week so that those great natural oils don’t get washed away in the shower. Oils that are produced by the scalp are necessary for healthy hair and scalp maintenance. I was using the stop loss conditioner, yet am now delighted to have accomplished that and move on to this one next. I feel certain I'll like it as have gotten such nice results so far. I have some thinning and fine, thin hair but gets color treated and highlights which causes damage. These products bring my hair back to life looking healthier and shiny. I have not seen any new hair but it's only been a short time. I really believe in these products to do as they claim. I have been using the grow new hair collection since January and it is amazing how it works. I get Brazilian blowouts quarterly and it's safe to use. totally worth the money and time to invest in. I love this conditioner!! It conditions and gives me fullness. I have fine curly hair and it does not weigh it down, plus the smell is amazing! This is wonderful, my tangled mass after showering and applying a conditioner leaves it feeling smooth without the weight of wax leaving it with only soft clean hair! I haven't used this product long enough to tell if i'm growing new hair but it does make my hair soft and I feel it doesn't weigh down my hair. It's a very light conditioner and works well. The smell is a little woodsie.. but everyone I have asked said it doesn't smell bad. I've also noticed I do have a lot of hair that seems to be falling out but I don't know if that is from the product or just the normal amount of hair you lose a day. The bottle is a nice size and hopefully lasts me quite some time seeing it's really expensive to buy these products. I want to try more of the products just wish they weren't so expensive. I’m enjoying this conditioner. I’m still experiencing detox with these products and I know this won’t last forever. My hair will be healthier as an end reslt. I bought this for my husband but I end up using it on myown hair. It makes my hair smell amazing, so soft, takes tangles out, you only need a small amount. I am going to purchase my own bottle. The hair conditioner is wonderful! It does the job with out leaving a heavy, overly slick feeling, and my hair doesn't get greasy in just two days as before.